When fully autonomous vehicles become mainstream, a new type of economy will emerge that will be worth $7 trillion by 2050, according to Intel. Fully autonomous vehicles will bring forth a new “passenger economy” worth $7 trillion by 2050, according to new research from Intel and Strategy Analytics. The passenger economy does not include the autonomous vehicle industry itself; rather, it’s a “peripheral” economy or a “side-effect” of autonomous vehicles becoming mainstream, Doug Davis, VP of Intel and GM of Intel’s Automated Driving Solutions Group, told journalists on Thursday. While the predicted value can be disputed, Intel’s overarching point is that fully autonomous vehicles will generate new types of products, services, and business models as today’s drivers become tomorrow’s idle passengers. Given autonomous vehicles are expected to free more than 250 million hours of consumers’ commuting time per year in some of the most congested cities in the world, a key opportunity will be how to capitalise on all of the time people will save when they’re no longer having to drive, according to the Intel-Strategy Analytics study. Due to the scope of the opportunity, Intel CEO Brian Krzanich said it would be wise for businesses to start thinking about their autonomous strategy now. “Less than a decade ago, no one was talking about the potential of a soon-to-emerge app or sharing economy because no one saw it coming. This is why we started the conversation around the Passenger Economy early: To wake people up to the opportunity streams that will emerge when cars become the most powerful mobile data generating devices we use and people swap driving for riding,” Krzanich said. “Mobility-as-a-service” will be the dominant business model, disrupting traditional patterns of vehicle ownership, maintenance, operations, and usage, according to Intel. In fact, the chip giant envisions a future where individual vehicle ownership is less important, and shared commuting on autonomous vehicles is the norm. A block away from Intel’s Developer Forum in San Francisco, AMD brought together a select group of media and analysts to make one thing clear: Its long-awaited Zen processor actually exists, and it’s on track to ship early next year for desktops. Surprisingly, the company is aiming directly at the high-end PC gaming market, whereas its last few chips appealed more to budget builders. People can get its compute board and camera kit separately, though. 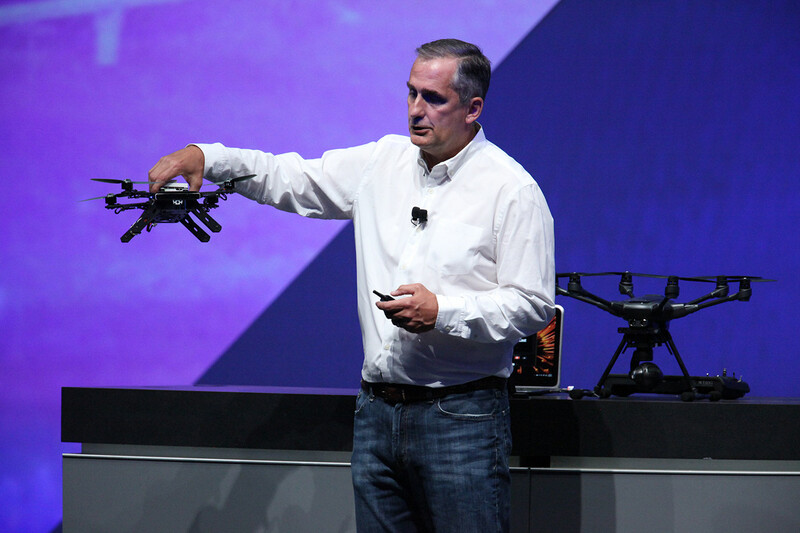 Intel has introduced a quadcopter called Aero at its annual developers conference, and we’ll bet you can guess its target audience based on the event. That’s right, Aero was specifically designed not for hobbyists or for commercial purposes, but for developers who want to create and test apps for drones. The company said it’s the “fastest path available from Intel for developers to get applications airborne.” Aero is powered by an Atom processor and comes equipped with Intel’s RealSense camera for vision. It’s also preloaded with AirMap, an app that tells you where you can and can’t fly, gives you real-time info on wildfires and the like, as well as gives you an easy way to plot routes. Chip maker Intel and British semiconductor IP company ARM announced an agreement that could help boost the chip giant’s custom foundry business. The deal, revealed today at the the Intel Developer Forum in San Francisco, will allow Intel Custom Foundry to make ARM processors for third parties.